Pure Collagen Ampoules are wonderful for firming, hydrating, and nourishing the skin. These fragrance-free, color-free, and paraben-free ampoules are perfect to use for preventing dryness during the winter season, after chemical peels, after microdermabrasion, laser skin rejuvenation, microneedling, and after intensive drying acne treatments. Ideal for clinical oxygen treatments. Natural, hypoallergenic, cruelty-free. 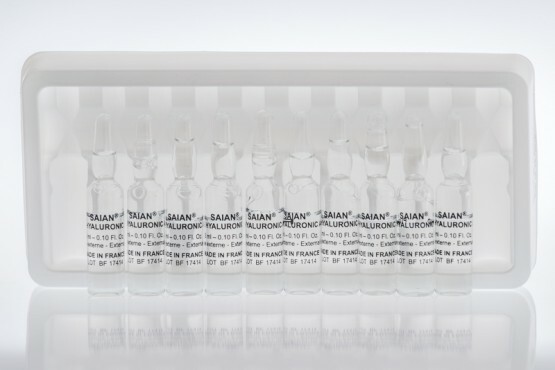 SAIAN Collagen Ampoules are perfect to use with Collagen Infusion Therapy under the Pure Collagen Masks. They increase the results after microneedling, and are recommended by physicians for sensitive skin. You break off the top and may use multiple times. Great for travel. Perfect under any skin care product. This was my first time trying this product- it has helped everything from texture to hydration to minimizing pores, evening out color, helped hyperpigmentation, acne and acne scarring and tightening and firming- I cannot wait to see what continued use does!! Makes your retinoid and other products work better! Hyaluronic Acid, Water, 2 vegetable based preservatives. Vegan, Cruelty free, no parabens or fragrance.